This guide will help you understand the most important concepts in Spring Boot in preparation for a Spring Boot Interview. Spring Boot is the best Java framework for microservices. We recommend you to become an expert at Spring Boot! Q : Spring Boot vs Spring MVC vs Spring - How do they compare? Q : What is Auto Configuration? For complete answer with code examples refer Auto Configuration. Q : What are Spring Boot Starter Projects? Starters are a set of convenient dependency descriptors that you can include in your application. You get a one-stop-shop for all the Spring and related technology that you need, without having to hunt through sample code and copy paste loads of dependency descriptors. For example, if you want to get started using Spring and JPA for database access, just include the spring-boot-starter-data-jpa dependency in your project, and you are good to go. Q : Can you explain more about Starters with an example? Any typical web application would use all these dependencies. Spring Boot Starter Web comes pre packaged with these. As a developer, I would not need to worry about either these dependencies or their compatible versions. Q : What are the other Starter Project Options that Spring Boot provides? Q : How does Spring enable creating production ready applications in quick time? Spring Boot aims to enable production ready applications in quick time. Spring Boot provides a few non functional features out of the box like caching, logging, monitoring and embedded servers. What is the minimum baseline Java Version for Spring Boot 2 and Spring 5? Spring Boot 2.0 requires Java 8 or later. Java 6 and 7 are no longer supported. Q : What is the easiest approach to create a Spring Boot Project? Q : Is Spring Initializr the only way to create Spring Boot Projects? Spring Initializr makes it easy to create Spring Boot Projects. But you can setup a maven project and add the right dependencies to start off. In our Spring course, we use 2 approaches to create projects. The first one is start.spring.io. In Eclipse, Use File -> New Maven Project to create a new project. 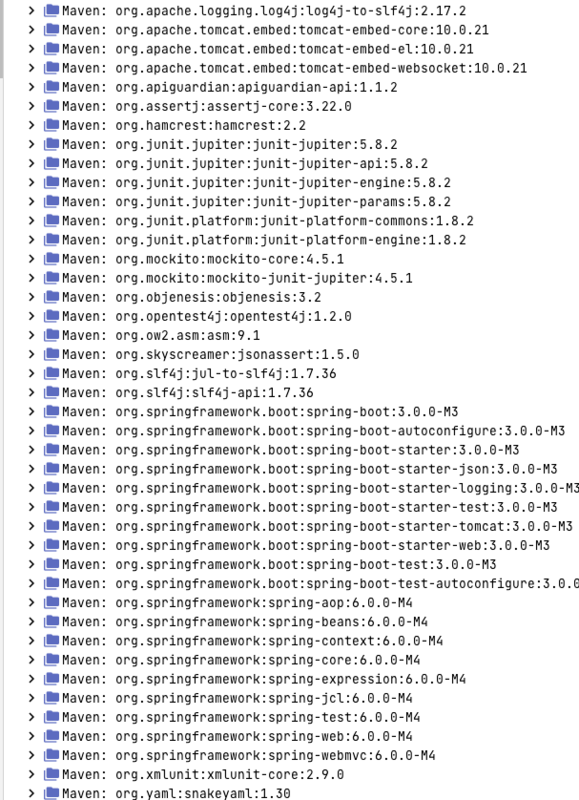 Q : Why do we need spring-boot-maven-plugin? Q : How can I enable auto reload of my application with Spring Boot? Use Spring Boot Developer Tools. In my trials, we found LiveReload buggy. Do let us know if you have a better experience with it. Q : What and Why Embedded Servers? Embedded server is when our deployable unit contains the binaries for the server (example, tomcat.jar). Q : How can I add custom JS code with Spring Boot? Create a folder called static under resources folder. You can put your static content in that folder. Error : HAL browser gives me unauthorized error - Full authentication is required to access this resource. How can I fix it? Q : What is Spring Data? Q : What is Spring Data REST? Q : How does path=”users”, collectionResourceRel=”users” work with Spring Data Rest? path - The path segment under which this resource is to be exported. collectionResourceRel - The rel value to use when generating links to the collection resource. This is used when generating HATEOAS links. Q : What happens in the background when a Spring Boot Application is “Run as Java Application”? If you are using Eclipse IDE, Eclipse maven plugin ensures that as soon as you add a dependency or make a change to the class file, it is compiled and ready in the target folder! And after that its just like any other Java application. When you launch the java application, then the spring boot auto configuration magic kicks in. It launches up tomcat when it sees that you are developing a web application! Q : Can we use jetty instead of tomcat in spring-boot-starter-web? Q : How to generate a WAR file with Spring Boot? Q : How to deploy to a different server with with Spring Boot? Generate a war from the project. Deploy it to your favourite server (Websphere or Weblogic or Tomcat or …). Q : What is the difference between RequestMapping and GetMapping? RequestMapping is generic - you can use with GET, POST, PUT or any of the other request methods using the method attribute on the annotation. GetMapping is specific to GET request method. It’s just an extension of RequestMapping to improve clarity. Q : Why do we recommend not to use Spring Data Rest in real world applications? We think Spring Data Rest is Good for quick prototyping! Be cautious about using this in Big applications! With Spring Data REST you are exposing your database entitities directly as REST Services. With Spring Data REST, you are not considering either of those. You just expose entities as REST Services. Thats why we suggest to use it for quick prototyping or the initial evolution of a project. It may not be a great idea for a fully evolved project. Q : How do I change the package name of a project in Spring Initializer? Good news is you can customise it. Click the link “Switch to the full version.“. You would be able to configure the package name you would want! Q : Where can I find the complete list of properties that can be configured in application.properties? Q : What is the difference between JPA and Hibernate? When we use JPA, we use the annotation and interfaces from javax.persistence package, without using the hibernate import packages. We recommend using JPA annotations as we are not tied to Hibernate as implementation. Later (I know - <1% Chance), we can use another JPA implementation. Q : In which layer, should the boundary of a transaction start? We recommend managing transactions in the Service layer. Logic for business transactions is in the business/service layer and you would want to enforce transaction management at that level. Q : What are the dependencies needed to start up a JPA Application connecting to in memory database H2 with Spring Boot? In a Spring Boot project, you should be able to launch up H2 Console as long as you ensure the following dependencies are on the class path. An in-memory database is live only during the time of execution of the application. It is an efficient way to learn a framework. This is not how you want your real world applications to behave. We explain how to connect to a database of your choice in the answer to the question “How do we connect to a external database?”. Q : How is Hibernate chosen as the default implementation for JPA without any configuration? Because of Spring Boot Auto Configuration. The Starter spring-boot-starter-data-jpa has a transitive dependency on Hibernate and JPA. When Spring Boot sees Hibernate in the class path, it auto configures it as the default JPA Implementation. Q : Where is the database connection info specified? How does it know to automatically connect to H2? Thats Spring Boot Autoconfiguration magic. Q : How do we connect to a external database like MSSQL or oracle? Q : What is the default h2 database name configured by Spring Boot? Why is the default database name testdb? spring.datasource.name=testdb # Name of the datasource. If you are using an H2 in-memory database, thats exactly the name that Spring Boot uses to setup your H2 database. Q : What happens if H2 is not in the classpath? Q : Can you give an example for ReadOnly as true in Transaction management? When you read stuff from the database, user details or any other details, you wanna set read only on the transaction so that Hibernate does not need to check for changes to the entities. This is more efficient. Q : What is best way to expose custom application configuration with Spring Boot? The problem with @Value is that you would have your configuration values distributed through out your application. A better option would be to have a centralized approach. You can define a configuration component using @ConfigurationProperties. Q : What is the need for Profiles? You want to have different application configuration in each of the environments. Profiles help to have different application configuration for different environments. What is the configuration for various environments in different profiles? Set the active profile for a specific environment. Spring Boot would pick up the application configuration based on the active profile that is set in a specific environment. Q : How can you use profiles to configure environment specific configuration with Spring Boot? Profile is nothing but a key to identify an environment. The default application configuration is present in application.properties. Let’s consider an example. We would want to customize the application.properties for dev profile. We would need to create a file with name application-dev.properties and override the properties that we would want to customize. Similarly you can configure properties for prod profile. Once you have profile specific configuration, you would need to set the active profile in an environment.